I use both because I turn the lights on around 4pm and off around 9pm to mimic the hours of the summer sun and the heating pad to keep the soil warm all night for summer crop seeds that might be fussy about such things. I use a heating pad and no lights when starting my seeds. As soon as they sprout they come off the pad and go right into the sunny window. Well, unless it's cloudy for days and way below freezing, in which case they go on the kitchen counter in the under cabinet florescent light. Thank you so much. I will have to use the lights & heating mat. I don't have a sunny window or enough counter space to use a fluorescent. I keep thinking I need a new place with a better yard for my gardening. Now I'm beginning to think I need a new house with either a larger kitchen, a separate dining room (Sanderson's seed growing space), or maybe a large mudroom (sunny, of course) to start plants in....AND a better (read larger) yard. Maybe I'll start playing the lottery? Melen, I don't use heating mats, and the flats are on a cool tile floor with beach blankets underneath. The lights are on a timer set for 8 AM to 10 PM. 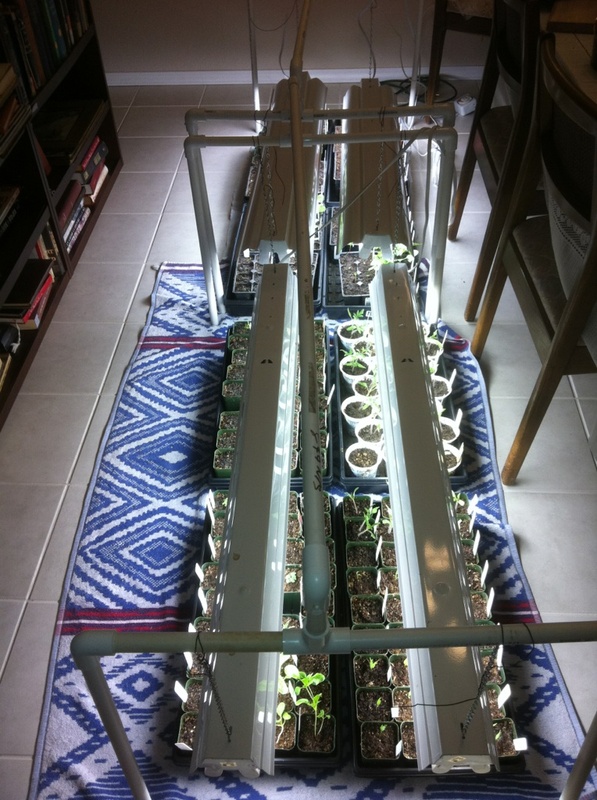 The lights start off 5" off the floor and are raised slowly as the plants grow. The number of pots under the lights are determined by the number of squares to plant. 32 pots fit in a 10" x 20" tray = 32 sq ft of garden or 32 garden pots. I also grow flowers for the flower beds, so I have quite a few trays under the 4 lights. You just need to find a spot out of traffic for your set up. I use neither mats nor grow lights. I've got an east-facing window with small shelving units on a desk. So I turn the plants every other day or so. Now, once the greenhouse is done.... I'm not sure how I'll handle it. DH has put electrical outlets in there for me, but I don't think he'll be thrilled with the idea of having lights on all night. And since the gh is on the east side of the house, I'm not sure how much I'll need them. @Mellen wrote: Thank you so much. I will have to use the lights & heating mat. I don't have a sunny window or enough counter space to use a fluorescent. Melen, for your first year I would try it without the heat mat. I think a good light source is more important than the heat mat. How much room do you have available for growing indoors? @CapeCoddess wrote: I use a heating pad and no lights when starting my seeds. As soon as they sprout they come off the pad and go right into the sunny window. Well, unless it's cloudy for days and way below freezing, in which case they go on the kitchen counter in the under cabinet florescent light. Oops! You're right. Mat only until the seeds sprout. No need to waste the lights on naked dirt. TD. Using the milk carton method opens up yet another opportunity to plant more seeds. We're having good weather all the way until Christmas so I should be able to get a lot of these mini-greenhouses set up. Some seeds need light in order to germinate, lettuce is among them. Shhh...don't tell my lettuce seeds that, or they won't behave the way I need them to. @llama momma wrote: Does the heat mat stay on at night or do I turn it off to simulate night temps for new seeds just planted? Have no idea what temps the unsprouted seeds want... and just spent 1/2 hour forum searching for this answer I give up! Leave it on until the seeds sprout. Yep. Then get the flourescent lights going, or southern exposure. Sorry Trolleydriver. I'm a little behind in everything. I'm excited to be retiring; however, this training other people is exhausting! It's so much easier to just DO IT, than to explain it. I'm not very good at the explaining part. The end result is I get home, eat & crash. I have a small house: East side one window over the kitchen sink; south side one window in the dining area (part of the kitchen) but there is a porch which shades it so no light there. The bedrooms are all on the west side. Good sun comes through the two west windows so that might be a possibility? The master bedroom has one window which faces north. Not a lot of light there. I believe I really don't have a lot of places I could put seedlings, so lights might be my only option. I do like Jimmysee's crock pot. That is innovative! This looks like a good buy for 8 seedling trays. ?? The tile floor in the formal dining room is 60*F and I would like for the seeds to sprout faster with a warmer floor. If I understand correctly, the heating mat is for germination, only. Then the shop lights go on. Looking at the chart in this link, I'm thinking of 70*F. Comments? 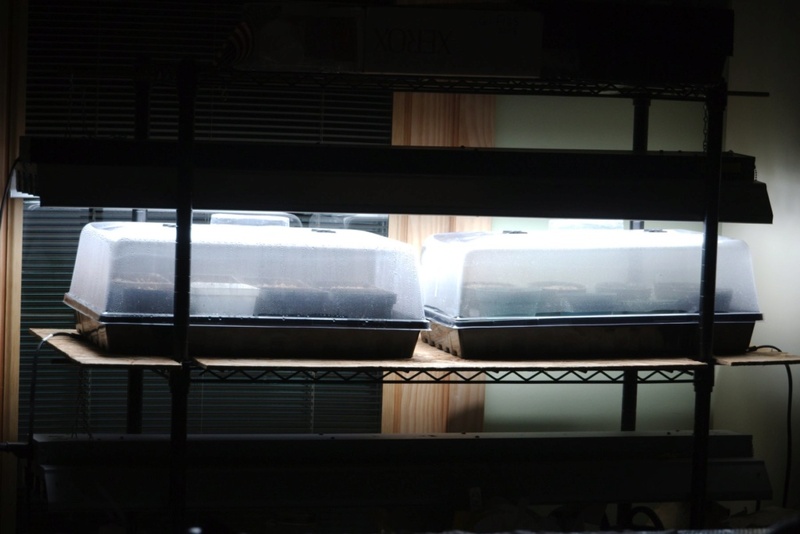 I always use heat mats under my 1020 trays, until there is about 75% to 80% germination and then I unplug the mats and remove the clear plastic domes. Seeds germinate in about 1/2 the time with the heat mats compared to not using them. You can seed the heat mat cords at the end of the trays. The heat causes the domes to condense humidity, which helps with germination. Sanderson, I have a set-up similar to this and the mat will hold 4-1020 trays. I like that you are getting a mat with a thermostat. You can dial in the temperature needed for germination. It wasn't until I had a thermostat that I got rosemary to germinate at 70F. 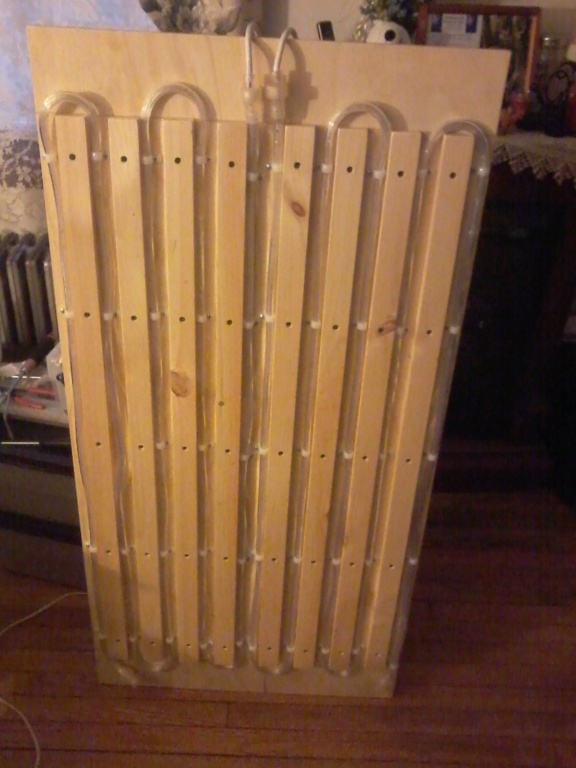 I also have a home made germination station that is 2'x4' piece of plywood with two 18' rope lights as the heating source and also holds 4-1020 trays. The price of germination mats have come way down since I fabricated it but did pick up a couple of extra rope lights before Christmas but may go back and see if there are any on sale at Big Lots. Believe it or not keeps temperature somewhere between 75-80F. I double check using a beverage thermometer in a cup of water inside the high top. 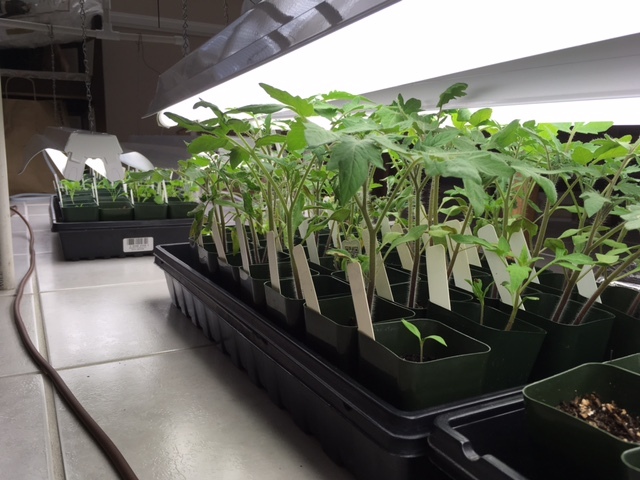 To answer your question about temperature depends on the seeds you are trying to germinate. OhioGardener, I too like the high tops but I will pull trays off the germination mat before any of the seedlings get leggy as most seeds I germinate don't need light to facilitate germination. Germination continues after, even at room temperature. I have had seeds refuse to germinate and I have given up on them usually towards the end of April, placed them out in the small plastic greenhouse on the deck only to have them pop up a week or two later. I do sow in used 10 oz. mushroom containers I get from the supermarket with mushrooms in them, rectangular plastic. I get 15-18 seeds planted in each and 5 will fit in a 1020 tray. When second set of true leaves appear I pot up to larger containers. Another tidbit I picked up and will try to verify is that celery needs to come off the mat daily to simulate day and night difference. I was having a problem for the first time last year and it seemed to do the trick. I will also be trying to germinate flowers this year, so this should be an hilarious learning curve as I know very little about flowers but it is time to learn as the more I know, the easier it will be to carry on a conversation at the garden parties I hope to be attending this year. Thank you guys (and anyone else that will be replying) for your responses. Dan, I haven't seen rope lights used but your set up is nifty. The price of the 4-tray mat was so enticing, and with your replies, I think I will go ahead and buy two for the eight trays I usually have (flowers included). I did it! $100 for 8 trays' worth of heating. That's $12.50 each, CA tax $$$ included. Sanderson, I will try and take a picture of my rope light germination station and post it later. I did find a germination temperature chart for flowers that I will post the link for. I just received my seeds from The Rhode Island Master Gardeners and The University of Rhode Island. They are last year's seed and as an individual I get them for 20 cents per package because most of what I do with them is for non-profit or as hand-outs after gardening talks I give. I am going to germinate and pot up some flowers and vegetables for my Tolland County Master Gardener Plant Sale in May. Because of budget cuts we have been tasked state wide to raise money for UConn Extension which I am not happy about. I feel like I have been coerced into working for the Sheriff of Nottingham and I always thought of myself as Peter Pan, I know same sort of outfit but never could rationalize taking other peoples' money. Plus I had always refused to grow up until I got into gardening and started growing vertically. There are other charts/lists at this site and also a direct sow flower list. @Dan in Ct wrote: I will also be trying to germinate flowers this year, so this should be an hilarious learning curve as I know very little about flowers but it is time to learn as the more I know, the easier it will be to carry on a conversation at the garden parties I hope to be attending this year. One thing I know is that zinnias like it HOT to germinate, probably close to 80. And they take a while, but my house is cold so that may be why. Mine germinate when ever they feel like - no set time. Niffy flower germination chart. Bookmarked it. It looks like 70*F is a good compromise for the veggies and flowers. I won't be starting seeds until Feb but I am looking forward to a ligher germination rate this time. Delivery of the mats should be tomorrow. Amazon delivered the 2 heating pads yesterday and the box was heavy. I hope to play with them tomorrow. Sanderson, just saw this at Amazon and am going to post a link because it seems like yesterday these were $50. Granted no thermostat but a beverage thermometer will keep track. 10-20 degrees above ambient/room temperature. I'm getting one to add to a 2' led light set-up I made for seeds that need light to germinate. I don't endorse nor do I recommend this but I am going to try one. Just saying. Competition has brought the price down! As they are only needed for a few days, they should last many years. What a great buy! Adding a thermostat is only $16.95!